This guide demonstrates how to connect your ISDN BRI/E1/T1/J1 services to the Ozeki Phone System XE and how you should configure it for building a powerful communication system. If you have an ISDN modem and an ISDN card, we highly recommend you to use this extension, because with this, you can communicate by making and receiving calls. Connecting an ISDN phone line to Ozeki Phone System XE is very easy. It takes only a few simple steps. 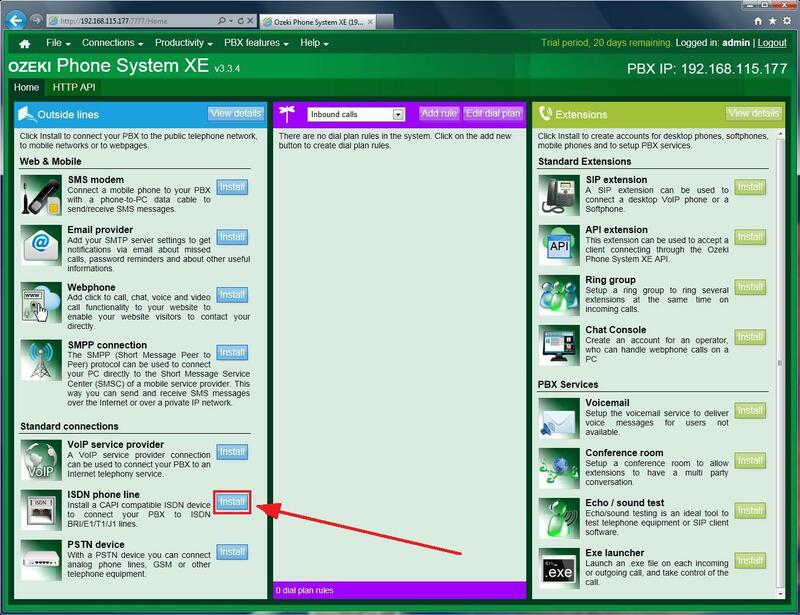 and the last step is to set up the card in Ozeki Phone System XE. After you have set up Ozeki Phone System XE with your ISDN phone line, you will be able to make and receive phone calls through your ISDN line with VoIP phones, in your office (Figure 1). What is an ISDN card? An ISDN card is a hardware device, that connects your ISDN phone line to your computer. It is either a PCI/PCI Express card, that you insert into the PC, or it is an externel unit, that is connected to the PC with USB. When you connect an ISDN card to your PC, you must install a driver, which implements an interface in Windows that makes it possible for applications in Windows to talk to the card. This interface is called CAPI, which stands for Common ISDN Application Programming Interface. Once you set up an ISDN Phone Line connection in Ozeki Phone System XE and installed the CAPI compatible ISDN card, you are ready to make and receive phone calls via ISDN lines. After you dialled a phone number, Ozeki Phone System XE sets up the call via the ISDN Phone Line. Once the phone is hung up, the PBX terminates the call. To show you the detailed setup steps, this guide will use an AVN Fritz box, which is a CAPI device and can be connected to an ISDN BRI phone line. The Installation steps are similar to all other ISDN devices, regardless of their connection method (PCI and USB devices can be set up the same way). First of all, you need to install Ozeki Phone System XE on your Windows PC. You can download the installer and perform the standard installation procedure, similar to any other Windows application. First, you need to plug the DC adapter into the leftmost connector ("Power") and into the socket as well. After that, connect the device and your Ozeki Phone System XE to each other by plugging an USB cable into the Windows PC where Ozeki Phone System XE is installed. Windows will detect your AVN Fritz device and will install the CAPI drivers for it automatically. You can check the correct connections on Figure 2. ISDN BRI/E1/T1/J1 phone lines give you excellent call quality, fast call setup, and availability to handle up to 30 simultaneous calls per line. Follow this guide to learn how to connect Ozeki Phone System XE to ISDN BRI/E1/T1/J1 services using a CAPI compatible ISDN device. For installing an ISDN Phone Line in Ozeki Phone System XE, you need to open the software first, then to log in by specifying your account details (username and password) on the web GUI. 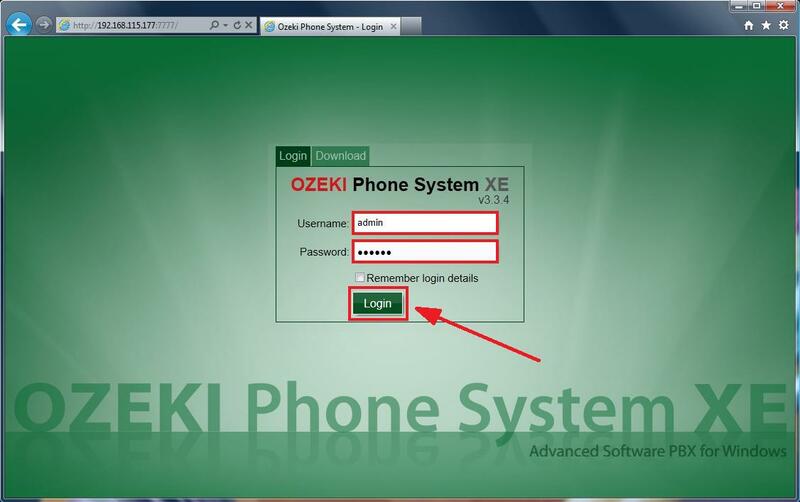 In order to log in, click on the Login button, use the account details (username and password), you have specified when you installed Ozeki Phone System XE (Figure 3). After you have logged in, the home screen of Ozeki Phone System XE appears. 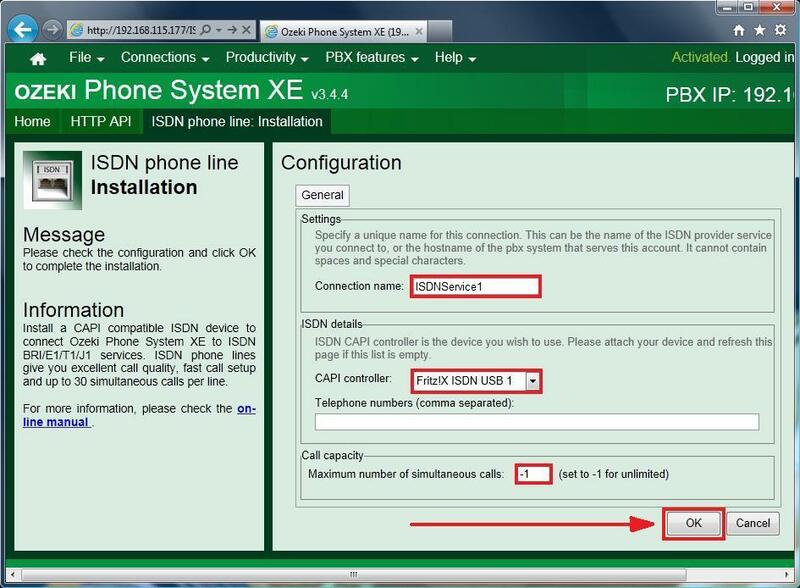 Now you need to click on the Install button which belongs to the ISDN Phone Line menu item in the Outside line section (Figure 4). After that, the Configuration panel of the new ISDN Phone Line can be seen. Figure 5 shows the General tab, which consists of three parts: Settings, ISDN details and Call capacity. In the Settings section you need to specify a unique Connection name. It cannot contain spaces and special characters. In the ISDN Details section you need to select your ISDN CAPI Controller from the dropdown menu. In the Call capacity section you can specify the maximum number of simultaneous calls. IF you need unlimited simultaneous calls, set to -1. If you have set everything in the Configuration panel, click on the 'OK' button. Finally, you only need to define a routing rule for one or more existing extensions. In order to initiate an outbound call, use an existing extension (it can be a desktop phone, a mobile extension or a softphone) and dial an external phone number. (In this example, the phone number should start with "81", such as "810036440123456789", but your prefix can be different. If you would like to learn more about making outbound calls, please visit the Outbound calls chapter. You can track the call status in Ozeki Phone System XE and you can see that the call has been made over the newly created ISDN connection (Figure 6). 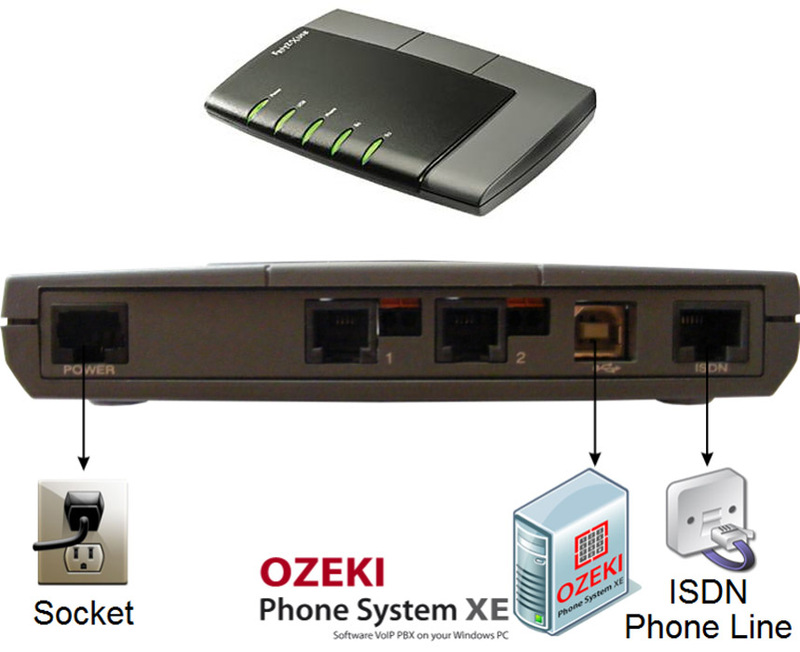 Ozeki Phone System XE ensures connection to the outside world via ISDN phone lines. This way, you can setup a flexible corporate system that offers several benefits and useful functionalities. In case you would like to build an efficient phone system, it is recommended to configure more types of service provider connections in Ozeki Phone System XE. Then you can easily define call routing rules for these connections to make efficient phone calls.